Trenbolone is an anabolic steroid which is used to increase muscle growth and appetite. To increase its effective half-life, Trenbolone is not used in a simple form, but is rather administered as ester derivatives such as Trenbolone Acetate, Trenbolone Enanthate or Trenbolone Hexahydrobenzylcarbonate (Parabolan). Plasma lipase then cleave the ester group in the bloodstream leaving free Trenbolone. Trenbolone Acetate is a highly potent androgen that produces very strong anabolic activity. It is a 19-nortestosterone derivative which is used to buildup muscle mass and to make the muscles formations stronger in a short amount of time. 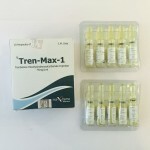 Trenbolone Acetate has the same properties and while administrating it users will only need one injection per week, while the Hexahydrobenzylcarbonate ester of Trenbolone extends the activity of the drug for more than two weeks. 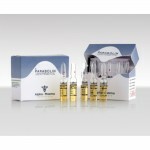 Trenbolone products are one of the strongest anabolic steroids on the market. They have the property to provide very hard, ripped muscles that are perfect for competitions in bodybuilding. Trenbolone has the property to burn the fat and the dieting athletes are able to preserve their lean tissue while using it. Trenobolone increases nitrogen retention in the muscles as well as red blood cell count. It also enhances the rate of recovery and regeneration of the human body. Trenbolone compounds increase the levels of IGF-1 and the sensitivity to it and it interacts strongly with the receptors of anti-anabolic (muscle growth preventing) glucocorticoid hormones. Trenbolone compounds have a binding affinity for the androgen receptor five times as high as that of Testosterone. Once metabolized, the drugs have the effect of increasing nitrogen uptake by muscles, leading to an increase in the rate of protein synthesis. It may also have the secondary effects of stimulating appetite and decreasing the rate of catabolism. Due to its virilization effects it should be used with great care by female athletes. Bodybuilders use Trenobolone compounds during a cutting phase combined a non-aromatizing anabolic such as Stanozolol or Methenolone. Te product can also be stacked with the addition of stronger compounds like Methandrostenolone or Testosterone. With the strong impact Trenbolone has on endogenous Testosterone, after concluding the cycle Human Chorionic Gonadotropin (HCG) and/or Clomiphene/Tamoxifen are recommended to be used.